Risotto. Quite possibly the world’s most perfect meal, and one of my absolute favorite things to cook. I love how the simple grains of rice come together to create a creamy, indulgent dish of loveliness. It’s very satisfying. I’ve mentioned in previous posts that I love risotto not only for its flavor, but also for its versatility. Once you’ve mastered the basic method, the possibilities are endless. I’ve made a ham and sugar snap pea risotto, fresh mozzarella and tomato risotto, even a mushroom and shallot risotto using red wine rather than white. It’s definitely a recipe that’s fun to play around with. Hidden amongst my embarrassingly large pile of recipes torn out of magazines was this risotto recipe from Bon Appetit. You’ll find leeks in many risotto recipes, but this was the first time I’d ever seen bacon. I knew I had to try it. Bring broth to simmer in medium saucepan; cover to keep warm. Meanwhile, heat oil in heavy large skillet (or saucepan) over medium heat. Add bacon and cook until crisp, stirring occasionally. Using slotted spoon, transfer bacon to paper towels to drain. Add leeks to drippings in pan; cook until soft but not brown, stirring often, 4 to 5 minutes. Transfer 2 generous tablespoonfuls leeks to small bowl; reserve for garnish. Add rice to pan; stir 1 to 2 minutes. Add wine; stir until absorbed, about 2 minutes. Add 1/2 cup warm broth to saucepan; stir until broth is absorbed. Repeat adding broth and stirring until rice is tender but still firm to bite and sauce is creamy, stirring almost constantly, about 23 minutes total. Add bacon, chopped parsley, butter, and 2 tablespoons cheese. Season to taste with salt and freshly ground black pepper. Divide risotto among 6 bowls. 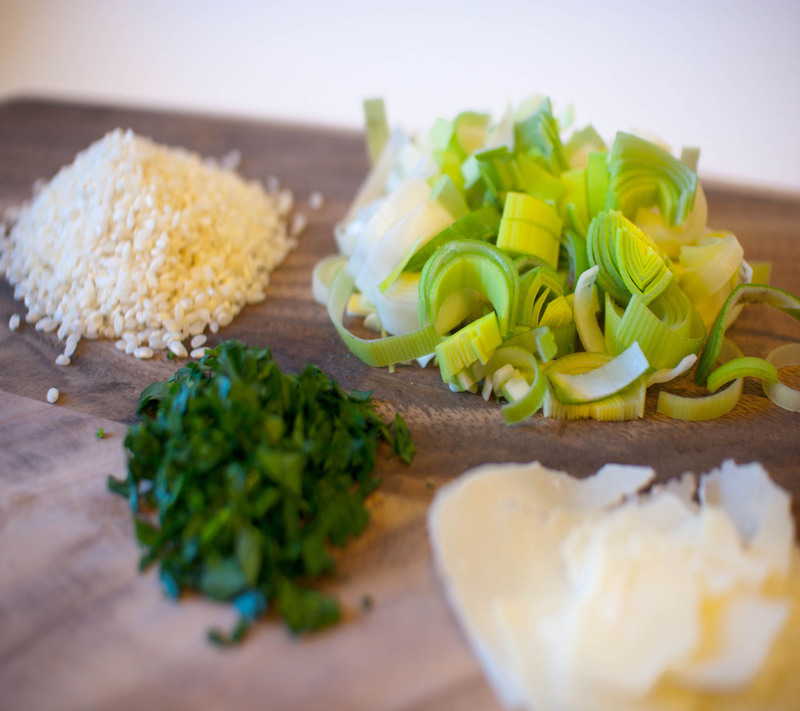 Top risotto in each bowl with chopped parsley, additional cheese, reserved leeks and freshly cracked pepper. 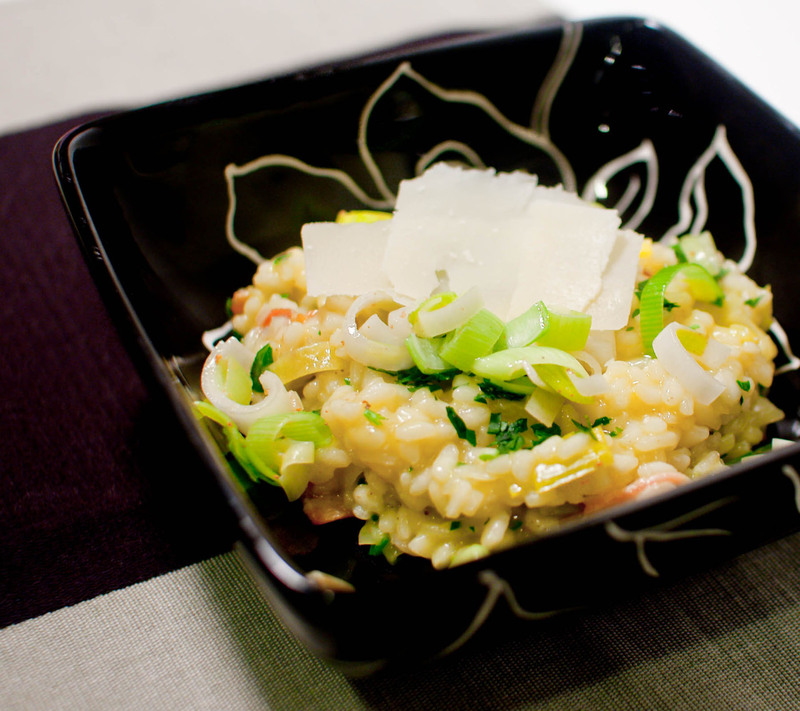 Yummy – what a great use of flavours for a risotto. Yum, yum! I’ve been looking for a new risotto recipe. And bacon anything gets me interested…I’m saving this one and sending some buzz. Nice work! That looks great! I’m here because I saw your comment over at my friend Barb’s blog. I’m a new subscriber and I can tell I’m going to love your posts. Thank you and welcome! I’m glad you’re here. Thank you for this recipe. Risotto is also one of my favorite meals. I love how it’s so delicious and so versatile. And to me, leaks and bacon make any meal better! Oh that looks sooo yummy good! And there’s bacon in it – score!! Oh my. I LOVE leeks. I eat sauteed leeks by themselves sometimes LOL. 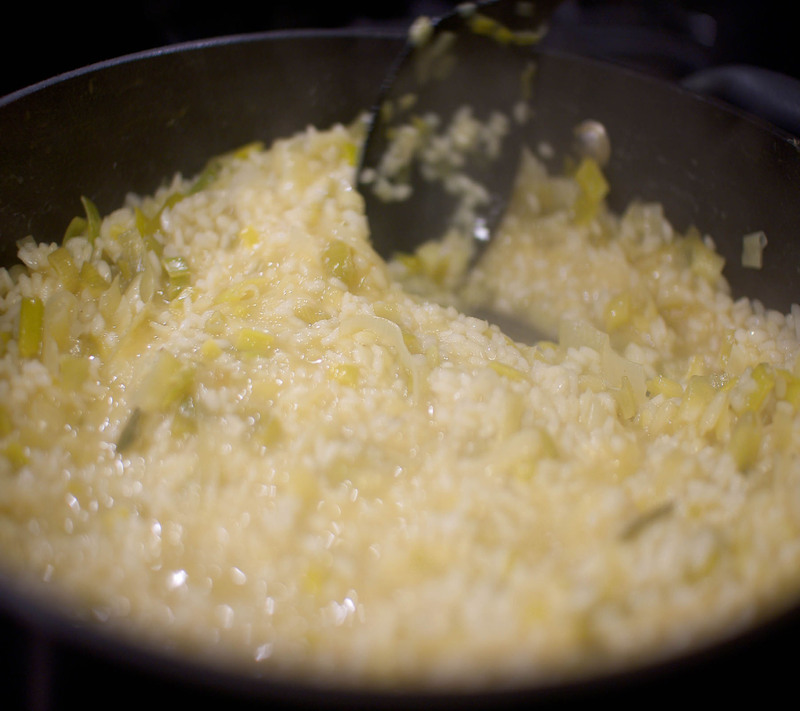 And I agree…risotto rocks! It’s nice to have that arborio sitting in the pantry because it really can be turned into any kind of risotto in 20 minutes. This looks really really good! I can almost smell nice aroma..wonderful idea and recipe! Your photos are stunning too! I agree with you, risotto is such a great dish because you can play with so many add-ins and change the flavors. I like the sound of the tomato mozzarella risotto you mentioned too. What an awesome sounding risotto. I have never tried my hand at risotto though I keep seeing recipes I want to try. I think Im over complicating it in my head. I love risotto and yours looks amazing. Love the combination of bacon and leeks! I made this recipe about a month ago. I was so excited b/c it sounded fantastic. Unfortunately, the entire dish tasted like bacon grease. I’m not sure if there were supposed to be instructions to drain some of the grease off at some point before adding the rice, but it was absolutely inedible if the directions are followed exactly as written. I have never made risotto before, but it was also very gummy – went from a little too firm to pasty in the blink of an eye. Pretty sure that was inexperiencse on my part, but the bacon grease flavor throughout ruined the whole dish. I’m sorry you had that experience. I don’t remember six pieces of bacon being overly overwhelming, but I can see how that might be an acquired taste. No, it wasn’t the bacon itself that was overwhelming – it was that the amount of bacon grease generated overwhelmed the entire dish. Possibly, my bacon was just overly fatty. I do want to try it again – I think I would just drain off most of the bacon grease before adding the rice and it would be better. The only thing I can’t fix is that it was my first time making risotto and it ended up gummy, but I fully acknowledge that is my fault for not knowing when to stop cooking it :-). It took me a few times to master it, too. And once you do, it’s oh so good!